Last week’s glimmer of hope faded quickly as existing home sales resumed their downward slide according to the National Home Sales Snapshot released by DataQuick. There were 162,418 properties sold over the previous thirty-day rolling period ending March 6th, 2.7 percent below the previous week’s total of 166,980 sold properties and 5.8 percent lower than the 172,508 properties sold four weeks ago. Sales volume was 39.8 percent below this year’s cycle peak of 269,817 sales which occurred during the 30-day rolling period prior to September 12th of last year. Last week’s home sales volume was 5.3 percent lower than the 171,563 homes sold during the same period a year ago but was still 14.3 percent higher than during the same period three years ago when 142,090 homes were sold. 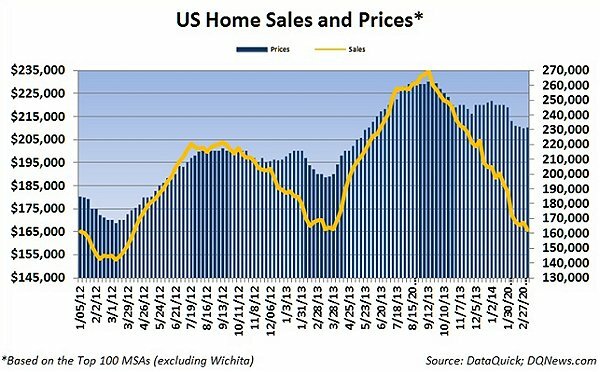 It was the ninth consecutive week that home sales have remained below the previous year’s levels. The median price of a home sold over the current thirty-day rolling period increased by $100 to $210,000 after falling by $600 the previous week. Four weeks ago the median home price was $213,000. Home prices were 13.5 percent higher than during the same period a year ago when the median price of a home was $185,000 and were 22.2 percent higher than the median price of $171,900 during the same period three years ago. Over the last seven years, median home prices nationwide have ranged from a high of $275,000 to a low of $168,500. Home sales volume over the last seven years has ranged from a high of 339,669 properties sold to a low of 124,051.